Have you noticed that experts appear to bid more of the time? This is partly because they bid a lot when they have bad hands, appreciating that a contested auction is always potentially more difficult. 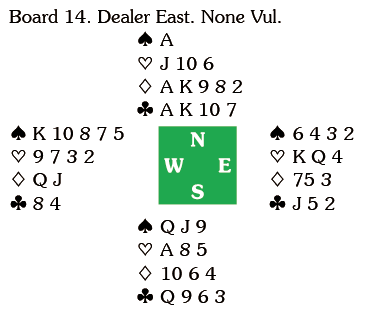 Declarer did not quite make the best of the play after a spade lead and finished with eleven tricks. Roy & Sabine play a complex system, and unless you are Al Hollander, you can’t always be sure what is going on. What you can say is that on this layout declarer cannot go down in 6 and indeed, declarer took all the tricks. 17 pairs bid this slam, but it was not the best result for NS, that distinction going to the pair who collected 1400 from 4 doubled. Once again Zia could not be kept out of the auction. East led the K and when Zia contributed the jack she continued with the queen, declarer ducking pitching a club from dummy. He took the next spade, parting with another club and cashed the K. After that, he could not take more than eight tricks. There is a way to get to nine tricks, but it gives up on the possibility that East might have a singleton club honour. 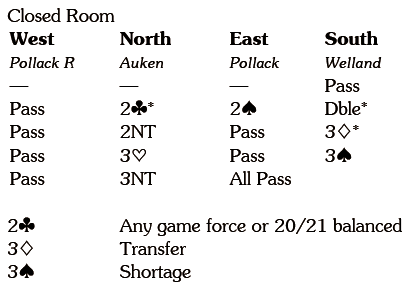 After taking the A, declarer unblocks the diamonds and then plays the Q, covered by the king and ace. 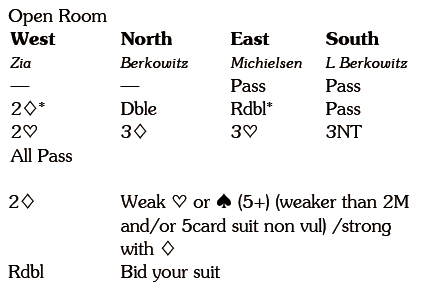 Now declarer cashes the jack of hearts followed by the king of diamonds. East, down to 1043 Q74 is in trouble. She has to throw a spade, but declarer can cross to the A and exit with a spade, East eventually having to lead into dummy’s club tenace. Making 3NT that way would have been some consolation for missing 6 contract that was available. 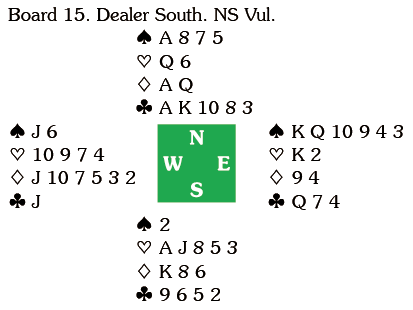 There is a note suggesting that South’s initial double was takeout of spades. Declarer followed the same line after the spade lead, so no swing. 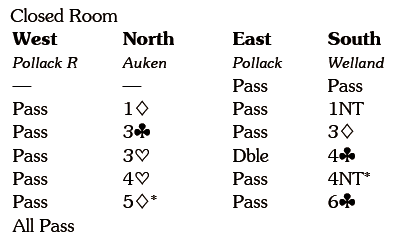 Only four pairs recorded +600 after a spade lead, but +630 appeared 14 times and +660 three times -and yes, the defenders nearly always led spades. Pride of place goes to the three pairs who bid 6 .